World class diversified dry fly action sportsmen will never forget awaits those who sample the outstanding accommodations at either Estancia del Rios or Cinco Rios Lodges Patagonia Chili. 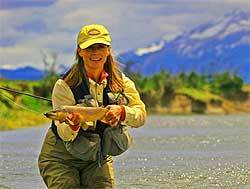 Located in the Asye’n Region a truly diversified dry fly venue for discriminating fly fishers. Cinco Rios Lodge nestled on the verdant banks of the Rio Simpson River features gourmet Chilean cuisine, expert seasoned guides and all the dry fly action you can handle. 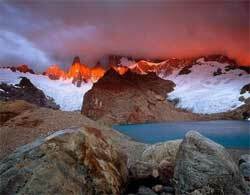 Land of Pumas, Glaciers, open Pampas, breath taking peaks, Blue green fjords, land of endless winds. One becomes quickly overwhelmed with the pure clean air and lack of crowds upon arrival. Meandering spring creeks full of hungry trout criss cross the Patagonic Pampas while perfect crystal clear virgin waters glisten in the rainforest! A sensory overload for nature lovers of all persuasions. 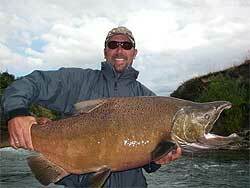 Wild Brown Trout, King and Coho Salmon opportunities round out this world class fly fishery. Rio Simpson most famous river in the Ayse’s area resplendent in 15 - 22 inch Brown Trout, many caught near the lodge. Exciting early mornings drifting for trout up to 30 inches, King Salmon caught in excess of 45+ pounds. Mayfly and Caddis hatches explode as you enjoy the misty Andes Peaks in the background. Your expert guides pointing at fat wild rising trout mild weather gentle winds outstanding dry fly action. Rio Emperador Guillermo crown jewel in a crown overflowing with choices has bestowed 100+ trout to more then one fortunate fly thrower. Languid clear pools and bubbling ripples full of 14-18 inch trout fly fisher Mecca indeed! Rio Desaque River is the recipient of Lago Caro’s drainage ( Expensive Lake ). Big shouldered Browns and overweight Bows dwell in this natural trout nursery. 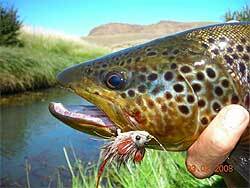 Trout over twenty inches are common in this more remote deeper water fishery where many trophies bragging fish gorge. Jet boats work this remote river with excellent sight fishing opportunities and close to shore dry fly action mornings and evenings. 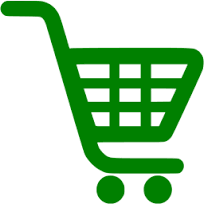 If one considers the eclectic dry fly waters available this fly venue is indeed a bargain. Nature lovers, Bird watchers, serious fly fishers consider Patagonia on your dream fly adventure list.